Daya Reddy was born in Port Elizabeth, South Africa. He completed a degree in civil engineering at the University of Cape Town, a Ph.D. degree at Cambridge University in the UK, and a post-doctoral year at University College London. He currently holds the South African Research Chair in Computational Mechanics, in the Department of Mathematics and Applied Mathematics at the University of Cape Town. He served as executive dean of the faculty of science at UCT between 1999 and 2005. Professor Reddy’s research lies in the domain of mathematical modelling, analysis and simulation in mechanics. He has made significant contributions to the theory of plasticity and to the development of stable and convergent mixed finite element methods. He maintains an active engagement in biomechanics, including research into aspects of cardiovascular mechanics. 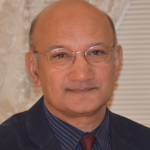 Daya Reddy is a recipient of the Award for Distinguished Service from the South African Association for Computational and Applied Mechanics, and the Order of Mapungubwe from the President of South Africa. He is an elected Fellow of the International Association for Computational Mechanics. He has held numerous visiting positions, including those of Visiting Faculty Fellow at the Institute for Computational Sciences and Engineering at the University of Texas at Austin and the Timoshenko Lecturer at Stanford University. In 2012 he received the Georg Forster Research Award from the Alexander von Humboldt Foundation. Lecture Abstract: Strain-gradient theories of plasticity were first proposed some three decades ago, with a view to extending conventional theories of plasticity in such a way as to capture size-dependent effects, which are important at the mesoscale. These size-dependent effects manifest, for example, as increases in yield strength with decrease in specimen size. Gradient theories introduce a length scale through which size effects can be modelled. These theories can be energetic in nature, in the sense that they incorporate gradient terms in the specification of the free energy. Alternatively or in addition, they can be dissipative, in that the gradient terms appear in the flow relation. The objective of this presentation is to present an overview of strain-gradient plasticity, with the focus on a class of thermodynamically consistent models. In contrast to conventional plasticity, in which the flow rule and yield condition are local n nature, it is shown for the gradient theory discussed here that the flow relation takes a global form. Recent studies of particular examples of non-proportional loading have highlighted interesting and novel features of dissipative strain-gradient theories. These features, such as a delayed resumption of plastic loading following non-proportional increments in loading, have been explored further both theoretically and computationally, and relevant results are presented and discussed.